"Cooking demands attention, patience, and above all, a respect for the gifts of the earth. It is a form of worship, a way of giving thanks." As we prepare our Thanksgiving feast today, I plan on putting on my most festive apron, digging deep into the gifts of the Earth and sipping this cognac sparkler! Pour Cognac into a Champagne flute; top with sparkling apple cider and top with a few dashes of bitters. Notes: Cognac is a grape brandy produced in a specific region of France, but this cocktail would be equally lovely with Calvados or Applejack, both apple brandies. 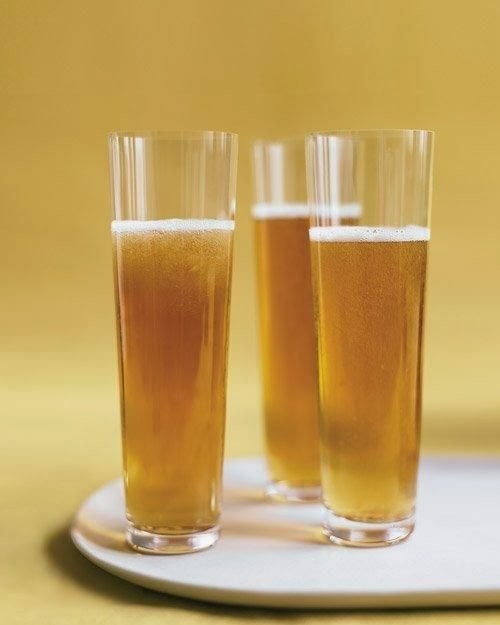 Hard cider can be substituted for sparkling non-alcoholic cider if you're serving this cocktail as an after-dinner treat. Cheers, and happy Thanksgiving! Image and Recipe from Martha Stewart Living. Have a wonderful Thanksgiving Lena! Gosh, I feel like I've done so much drinking but I also feel I should give this cocktail a chance...like tonight!